Brisbane Roar have announced on Saturday at Suncorp Stadium the club will farewell the most successful player in A-League history Michael Theo. After 159 appearances for Brisbane Roar, the experienced goalkeeper has called time on his tenure at the club after an incredibly successful eight seasons. 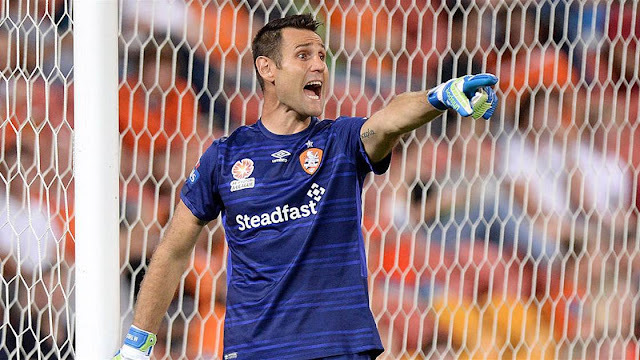 The three-time A-League Goalkeeper of the Year will live fondly in the memories of many Roar supporters for his heroics between the posts in countless matches, in particular in all three of the Club's Grand Final victories. A presentation will be made on the turf at Suncorp Stadium before Saturday's match against Central Coast Mariners and fans will have the opportunity to thank Michael in person post-match. "It's been an amazing eight years for myself. We've had great success and it has been an honour to play in front of the Brisbane Roar fans," Theo said. "Those grand finals, and the moments we shared with the fans, are something I will never forget. "I'd like to thank [Goalkeeping Coach] Jason Kearton and all the coaches that I have had in my time at Brisbane Roar, my family, my wife Victoria and all the players I have played alongside." With two titles at Melbourne Victory also to his name, our number one is the only player in Hyundai A-League history to have won five Championships. Managing Director David Pourre today paid tribute to BRFC's longest-serving goalkeeper. "Michael Theo is without question the most decorated and successful goalkeeper since the inception of the Hyundai A-League. His contributions, both on and off-field, make Michael one of the greatest sportsman in the history of Australian football," Pourre said. "He has built a legacy that will forever be remembered in the hearts and minds of all Brisbane Roar FC supporters having played a key role in all three Orange Sundays at Suncorp Stadium."